One of the oldest and the first national park in India the Jim Corbett Tiger Reserve is the ultimate choice for the wildlife lovers and nature lovers amidst the Himalayan foothills in Nainital. This is the ultimate reserve in India that initiated the “Project Tiger” and promoted for the wildlife conservation and thus holds greater importance among the visitors and the recognized position of Corbett also makes it more important as the spot is easily accessible to other recognized touring places. The popular touring spots around Corbett Reserve can be your fantastic achievements along with the tiger tour at Uttarakhand. Come and explore such impressive destinations and common spots around Corbett that can complete your Corbett tour in every respect. The Corbett Museum is actually a heritage bungalow of Jim Corbett, the famous hunter and renowned environmentalist located in Kaladhungi area. The location of the museum is crisscrossed from Nainital via Khurtpal, and is being maintained in the memory of the famous conservationist. The museum brings the memory of his life and activities all throughout his days spent at the Corbett vicinity. Many attractive belongings including personal articles, paintings, sketches, manuscripts and last hunt of its own can be explored in the museum. 14 kms from Ramnagar, on the way to Ranikhet the Garjia Devi Temple is a famous temple dedicated to Goddess Parvati and is located on a huge rock in the midst of the Kosi River. This beautiful hill is allotted with the beautiful ambience around the peaceful sights and brings a perfect example of trust and confidence. Legend says Parvati was the daughter of Himalayas and so she was also named as Girja (daughter of Himalayas). One of the major excursion sights near Corbett Reserve, the waterfalls inside the vicinity of Ramnagar Forest Division at 20 meters height, captivates too many nature lovers. It is the major attraction of the whole reserve since the location is being tufted with chirpings of birds in the background and the sound of the flowing water. The site is 4 kms away from Kaladhungi on Kaladhungi- Ramnagar highway and is the perfect location for leisure activities and family adventure holidays. It is the only site in Corbett where the tourists can have the maximum amount of fun by Trekking in the forests, bird watching at peace or nature walks at leisure. The Sunrise Point is the highest peak in Corbett along the surrounding area of Bhuwankhal village. The village which is also known as Kath ki Nao and attracts thousands of visitors for most of the nature’s fascinating sights where the Sunrise Point is among one of them. The location is also famous for one of the oldest Bungalow being built by the Britishers to bring the architectural glory amidst the dense foliage. 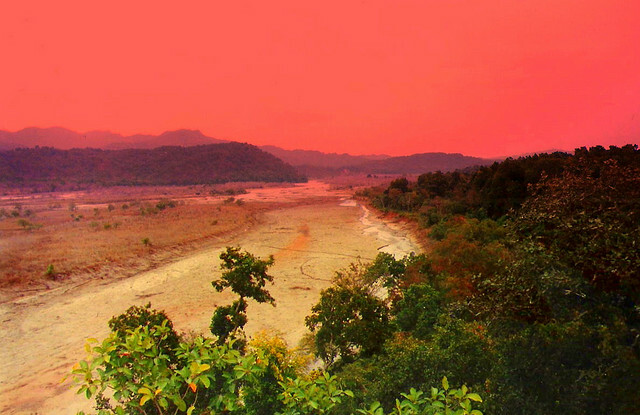 Besides, the highest peak of the Sunrise Point also allows the magnificent sight of both Kosi and Ramganga River. A must visit place for the nature and sightseeing experience. 63 kms away from the Corbett National Park, Nainital is the most famed hill station of Uttarakhand and Naini Lake is the most visited site of this amazing hill station. The lunar shaped lake that also appears like an eye from its highest peak is the ultimate point for leisure activities and family get-together. People enjoy boating in the lake along with picnic, sightseeing and recreational activities by the lake side. The northern end of the lake is called Mallital, while the southern one is called Tallital. The presence of a Lake Bridge at this lake also make this point more appealing since it connects the two banks that has quite a few shops as well as a post office, the only one in the world to be located on a bridge.